Almost on whimsy alone, I decided to kick this blog off with a review of a cigar with which I have absolutely no previous experience. So, let’s get right to it, shall we? 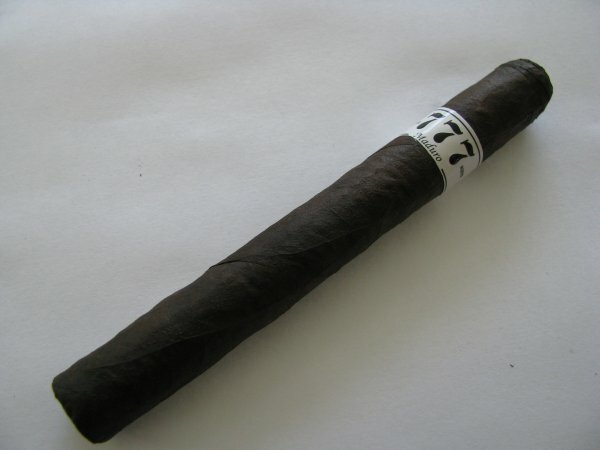 The wrapper on this stick is incredibly dark, almost an oscuro. It also seems to be very thin, and telegraphs every aspect of the binder below. Mine is undamaged, but has a very dainty, delicate feel to it. A number of veins are present in the wrapper, but none are significant in size. Overall, the visible construction is near impeccable. It is well capped, tightly wrapped, and I don’t feel any voids or dense areas whatsoever. Upon clipping, the prelight draw is very free, but surprisingly light in flavor. In fact, I would venture to say that the draw “feels” just about perfect. 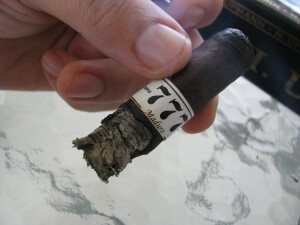 The aroma of the wrapper is reminiscent of a campfire, similar to charred wood or the smoke from a mixed hardwood fire. At the foot, however, is a pleasant hay or even barnyard smell – and I mean that in a favorable way. With these prominent scents, it is very surprising how little flavor comes through before lighting. 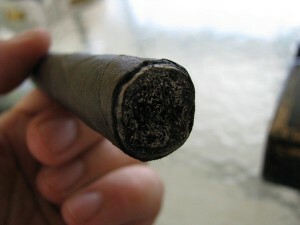 The cigar toasts readily, and lights very evenly. The initial flavor upon lighting comes through mildly as toasted oats, with a bit of burn if retrohaled. I have come to expect the burn, as it seems most Nicaraguan cigars have this effect on me. 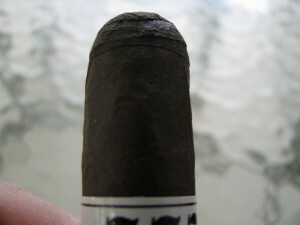 I am quite surprised that I notice very little in the way of sweet flavors that I typically pick up in maduro wraps. The sidestream smoke is noticeably astringent this early in the stick – not out of character with Nicaraguan tobacco, but not normally appreciated by others in the room. Definitely a cigar to be enjoyed outdoors. By the time I approach the 1″ mark, the nasal burn has mostly dissipated, and the cigar can now comfortably be retrohaled. It also self-ashed at about the 3/4″ mark. I am still getting some of those early oat-ish flavors, but the profile has definitely sweetened somewhat. A flavor of comfortably broken-in leather has become prominent – think of the old, hand-me-down baseball glove you may have had as a kid – which I find it quite pleasant. I do have to mention that I am struggling to keep it lit by this time. As the first two inches of the smoke near completion, I notice another conspicuous changeup in the flavors that are coming through. It has developed a bit of an earthy taste, almost of peat or malt. At this point, the burn has skewed a little more, and I have had to relight and touch up the cigar a few times now. The burnline has become erratic, and is scalloped in several places. This became a little more of a bother as I progressed into the next inch of the stick. The ash became more scaly and uneven as I got further into the smoke. The third inch also seemed to definitely strengthen at this time. Not uncomfortably so, but I do notice a slight tingle in the back of my throat – which generally indicates an increased presence of nicotine to me. I do have to say the taste never became harsh or ashy at any time. 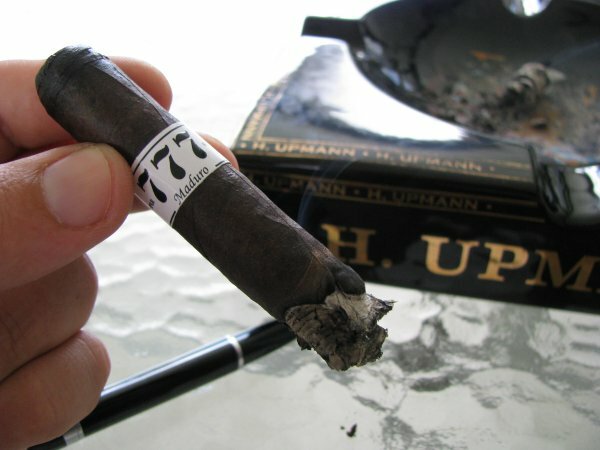 The flavors remained true and “unpolluted” throughout the cigar. This was impressive to me. Many times, this perceived increase in strength comes through as harshness to my palate. The aforementioned trouble with the burn has become more pronounced, however, and is actually somewhat bothersome. In the final stretch, the cigar did come around and behave with the burn. The flavors became more subdued, with coffee taking a lead role. I also notice that the sidestream smoke seems less astringent – although it is entirely possible this was only perceived due to the fact it has been hanging under my nose for an hour at this point. I am quite surprised that the flavors actually seemed to be more mellow toward the end of the stick. That is rare in my experience. the wrapper is beautifully dark! What a pity that yours stick was not too good. Did you try one of the others in the meantime? I did, and had similar burn issues. I really do enjoy the flavor, but the burn was bothersome. I gave one to a friend, however, and he loved it…and didn’t have the same problems. I have a couple more left, and I’ll be giving them a try before calling it quits. Great stick I found through a blind taste test. Definitely a great value stick which I’m am now a definite fan. A must try for value shoppershopper.